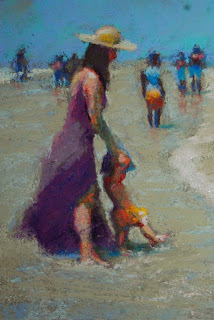 AT THE BEACH WITH AUNTIE is a 5x7 pastel on PastelBord. Bidding begins at $100. Auntie is my youngest daughter, Meg. The baby is my grandson, Victor. This was a few years ago; it was the first time we had taken Victor to the water. He was slathered with sunscreen, and when wet, was dangerously slippery. A very trying time for Auntie. and how you've captured them.